So far goldronin has created 111 blog entries. Opening Reception and Awards Celebration: February 2, 6:30 – 9 pm. A Unique Gathering of Artists and Patrons with live music, cash bar & hors d’oeuvres. Art may be purchased on site. Tickets available online or at the door. 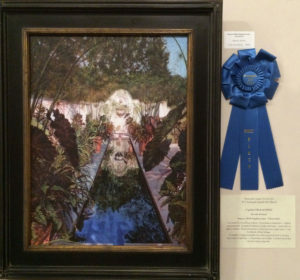 “Papyrus with Elephant Ears ~ Chanticleer” Oil on Linen has been awarded First Place for Oil/Acrylic Categories in the Plymouth Center for the Arts 51st Annual Exhibition. 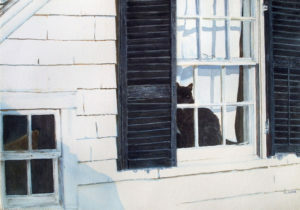 “Provincetown Window ~ A Watchful Eye” has been awarded Best in Show at the Cambridge Art Association Fall Salon show, hosted by The Cambridge Art Association.